For the second year running Aquabelle has sponsored the accommodation for three teams, 12 ladies across three apartments. We all arrived at Aquabelle on Thursday evening and caught up over a few red wines. 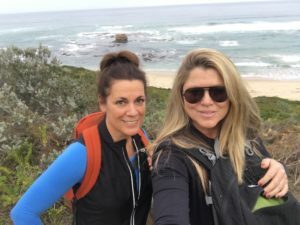 The walk began on Friday morning at 10:15. 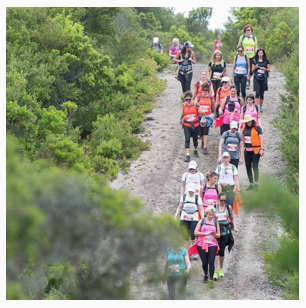 We decided it was not a race this year so rather than stress about the finish line, we decided to just enjoy the scenery… and it was spectacular! 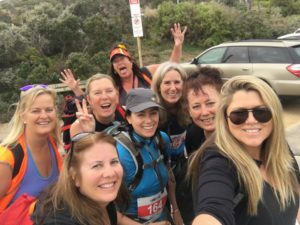 The Coastrek Team ensured we were on track, hydrated, motivated and entertained via “Love Stops” dotted along the route. The walk takes in the back beach coastline as well as Sorrento main street and bay beaches. It took us about 6 and a half hours and is quite do-able with little to no real ‘coast walk’ training. Last year we spent many Sundays walking the Brighton to Black Rock track. Trying to get us all together this year was like herding cats.. impossible!! So we decided to wing it. I was solely motivated by the glass of promised sparkling wine (or seven) at the end. And that first sip felt amazing. Well deserved back patting and cheers’ing followed when we all gathered in the amazing space of Aquabelle One. 12 ladies, feet soaking in Radox foot baths would not be possible in most holiday apartments, but this One is huge! Interpretive dance and lots of singing followed and then off to our own bedrooms for a very well deserved sleep. Our treat the following day was lunch at Yabby Lake Estate. 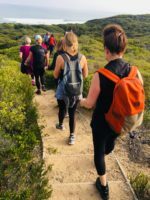 So it’s happening.. our two teams of four, Aquabelles One & Two will set out from Blairgowrie and walk 30kms to Point Nepean this Friday May 26.